Our favorite Motor Parkway father and son team Dave and Sammy Russo journeyed once again on their bikes to explore our favorite parkway from Lake Success to Melville. In the first of our new series, Sammy and Dave begin their successful journey in Lake Success. The Russo series helps to document the current condition of the Motor Parkway and uncovers several new surprises. Great job! So we did it yesterday. After a one year hiatus, Sam and I resumed our annual Vanderbilt Day tradition. What better starting point than the Deepdale Mansion in Lake Success, William K. Vanderbilt, Jr.'s residence in the early 1900s. The home is still standing, just steps off of the Motor Parkway. I'm sure not by coincidence. Moving west to east as always, we travelled 18 miles by bike from Lake Success to the Maxess Road Bridge in Melville We had a great time! A fantastic stretch of in intact LIMP from Lakeville Road. The remains of the Great Neck Lodge, now a kitchen. This is a very nice long stretch of the original 16-foot LIMP. 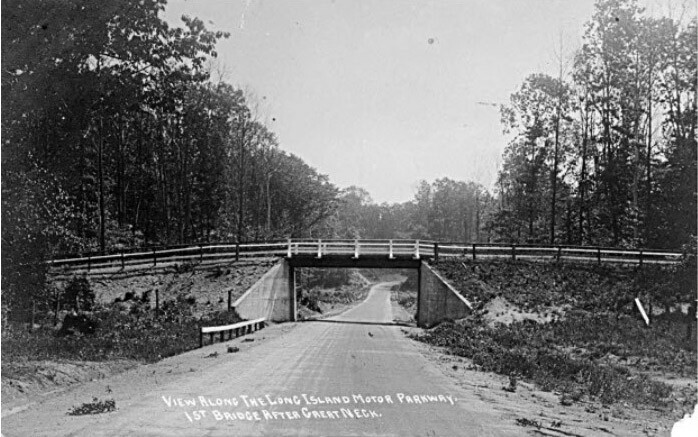 The three-foot concrete extensions were added to both sides of the road in the late 1920s. A hidden concrete post fragment. Moving further east you can see the end is coming. At the end of the school track, this section was the beginning of the embankment of the Robert Moses Bridge over the Northern State Parkway. The concrete extension piece survived, maybe it was too hard to take out! Not just a normal post, it still has wire! A double post with wire! One on the ground Sam had to pick up. Pinelawn through Bagatelle and a visit to Maddona Heights…. Great idea using the bikes, easier for exploring over all. And we all get to see Sam growing up every year, Dave! After a one year hiatus, Sam and I resumed our annual Vanderbilt Day tradition. He’s a little older now, and a little more “cool” so getting him to come with daddy on an all day exploration mission isn’t as easy as it once was, but welcome to parenting, I understand this is typical. My boyfriend and I would LOVE to explore the LIMP but aren’t sure how we should go about it. We’re afraid of someone calling the police on us. Any suggestions? We live in West Babylon so the Melville area seems to be the closest to us. Audrey—-that’s a tough section that doesn’t have the same history as the Nassau section, but it is cool but the thickets from Madonna heights eastward are not fun at all! Brian—-we always took bikes! Just one time we did the Suffolk journey we walked but other then that we always rode the bikes. There are long stretches with nothing to see, the bikes are the way to fast forward. There are many points where it’s tougher, and throwing bikes over fences is not fun, but it’s part of exploration!! Frank—-again you are the map master. But I think when we come to Bethpage I’m going to prove you wrong! Lindsay—-very cool. Five years ago I was in your shoes. Thankfully for us the technology available for us makes it so easy. Study the maps of Wayne and Frank, available on Howard’s site. Get a feel for what’s what and where. This site (and that of SBIII) has all details you need. Obviously you can take your phone to locations and see exactly where you are vs the LIMP. What I suggest is you visit some of the “well known” areas first and get a general vibe of the motor parkway and then go from there. Go to Roslyn lodge area, garden city till manager house section, dead mans curve in Bethpage, and the Bethpage bridge. When you go to spots here and there you can just drive, get out, check it out and go. Then maybe after you get a feel for things you’ll get crazy like me and Sam and do huge stretches in one day. Explore our former journeys on Howard’s site. If you get to that point reach out to us! Maybe we’ll meet you at friendlys for a post Vanderbilt day celebration! There is so much to see. So much history that very few people are aware of. Good luck! Lindsay - Ditto to Sam. Many LIMP sections including Melville, now rests on wide opened areas on LIPA property and easily accessible from the curbside, electrical towers/power lines running overhead usually present. Sometimes locals seeking shortcuts can be spotted. I find a GPS unit helpful to locate the hidden roadway buried below. Never had any problems with locals in these areas. It helps to be aware of your surroundings especially near private backyards, the barking dog will send out an alert. One time visiting the more secluded area near Madonna Heights, the trail ended abruptly at a water basin and we stumbled onto someone’s backyard! The homeowner spotted us and approached. Brian and I explained our exploration and it ended as a history lesson. The homeowner was unaware the iconic roadway once passed through his backyard. He was more concerned his German Shepherds being lose in the backyard in our presence. Good thing they weren’t! :D Be careful and have fun. Thank you all so much for the input! I’m super excited to start exploring! I’ll never forget the Madonna Heights section, Frank lol. Having dog treats handy is a good idea! The Maxess Rd location in Melville is super easy in both directions. You can easily spot the blue history sign marker on the east side of Maxess in between Duryea Road and Ruland Road. Main thing is to get started as several spots that were previously available are now inaccessible due to development (i.e., parts in Levittown near where I live where homes have been built over the roadway - actually where the Vanderbilt Cup Race Grandstand was) and in Garden City where Raymond Court meets the Parkway where while there are still lots there several posts were removed during a home renovation. Just be courteous and careful. 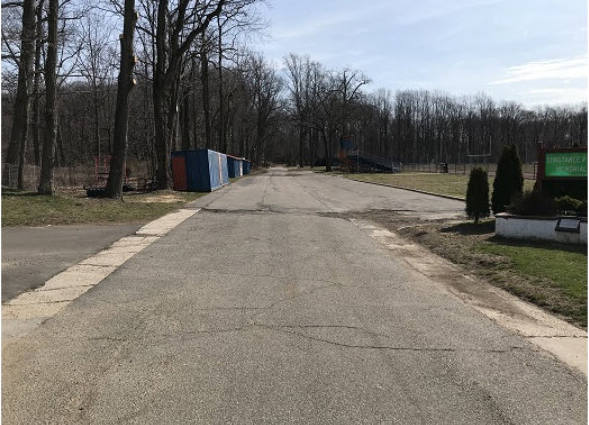 While treking through Deadman’s Curve in Bethpage on a Sunday morning around 7:30 once I heard some dogs barking and then a guy approached me and asked why I was snooping around in back of his property. I explained and he told me his backyard butts up against Deadman’s Curve and several times he found real estate developers taking pictures and wanting to know if the property was for sale. He doesn’t want any homes encroaching on his property so he was not too friendly to them. But to me he was fine. That was about the worst of it. Another time in the Bagatelle section I ended up wandering onto a tree farm and some workers came out in a truck. I explained and they were friendly and directed my off the farm. Best time to go explore is in the late winter when the thickets are not so bad (just about getting past that time now). Thank you, Art! I’ll have to check your website out. Now I know based on maps part of the Melville section is under the Newsday property but I’m curious if it was demolished or just paved/planted over. There’s going to be major construction in that area once they move out this coming fall. Great pictures, thanks for sharing for all us explorers!